When you have finished setting up your on-line diary and services take a few minutes to look over your set-up, if you have entered something incorrectly it is best you spot it now rather than a customer when you are 'live'. The most common problem we get in reported to customer service is that a customer cannot book a service with a certain therapist, the solution is simple - that therapist was not linked to that service in the diary set-up. 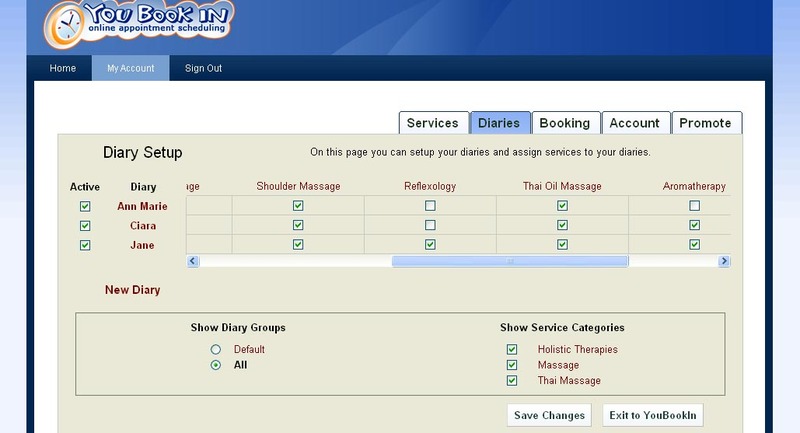 Every time you enter a new service you must assign staff to it, this is done under the diary tab in 'My Account'. This feature is important as not all staff can necessarily provide all services. In the above example Ann Marie is not trained in Reflexology or Aromatherapy so those services are not ticked against her name. Click on the above screen shot to make it larger. YouBookIn is very easy to use and set-up, but the best system in the world -Like Carlsburg we like to think it is probably us - is only as good as the data you input into it. So in summary - a little care and attention to detail at the set-up stage will pay dividends later. Having said that the majority of people set-up YouBookIn without any problems. What dissapoints me about your system - is it doesn't have a week to view - so I cannot tell how busy my week is going to be. Will you be providing a solution to this issue?